Radiators are heat exchangers which collect the heat from the engine and transfer it to the surrounding air. There is special chemical used in the engines called coolant which is stored in a reservoir. This chemical coolant circulates to almost all parts of the engine to collect the heat and then brings it to the radiator which is cooled by the sucked air from the radiator fans. Most frequently, the radiator leaks occurs through the rubber along the edges. Due to the heat, age, wear and tear the rubber gaskets get worn out which results in the leakage of the radiator. This leakage can be rectified by using the radiator stop leaks. They are chemical solutions which bind up with seals the leakage. The dense chemical combination in the radiator also forms a coat over the leaking regions and hinders the leak. Such chemicals shall be of great use to not only to car enthusiasts but also to the owners of old cars. Have a glance at the article below to collect more details about various outstanding radiator stop leaks. ATP AT-205 Re-Seal Stop Leaks is an outstanding product which is usually available in the form of liquid. It is mentioned to be a perfect formulation to treat leaks because it rejuvenates the seals and its associated metal accessories. It mingles well with the regular solutions like hydraulic oil, power steering oil, conventional and synthetic oil etc in order to provide proper renovation to the entire system. Most important it enters the radiators, finds out leaks and seals it in several hours. Usually, it takes 5 hours for complete renovation. It does not user petroleum distillates and so it does not wear or damages the rubber gaskets and seals in any way. Instead it forms a thick layer over the leaking region and seals it efficiently. The ATP AT-205 Re-Seal Stop Leak is a plasticizer which is used in rubber industry to give hardness and flexibility to the rubber. So, by its nature ATP AT-205 Re-Seal Stop Leaks provides intense care to the engine by healing the wears in it. Prestone AS145 Radiator Stop Leak is an effective solution which is used in heating cores, water pumps and radiators to get a complete refurbishment. It also contains active additives which reduce the corrosion in every nook and corner of the pumps and radiators. The corrosive outer layer is scrubbed out by this radiator stop leak and also it provides a complete metal finish to the radiator stop leak. The usage of the Prestone AS145 Radiator Stop Leak in a radiator shall not hinder the regular process of the radiator but, it seals even large leaks even with the minimum amount of the solution. As you know, pitting is the process of formation of minute pores and holes all over the surface of the metal. This Prestone AS145 Radiator Stop Leak reduces pitting greatly thereby increasing the life of the eminent parts of the radiator and its accessories. K-Seal ST5501 Multi-Purpose Stop leak is a meticulously formulated fluid which provides a satisfactory solution to the problem of leaks in the radiators. It is usually mixed along with the coolant and just used in to the regular system. The antifreeze solutions take this K-Seal ST5501 Multi-Purpose Stop leak everywhere it goes and allows the stop leak to fix the problem. It can even treat cracks and small fissures which are formed on the metal surfaces, free plugs, cylinder heads, heater cores, water pumps etc and more evidently it provides a permanent solution the leak issue. Unlike any other stop leak solution, K-Seal ST5501 Multi-Purpose Stop leak does not require any kind of flushing and draining after using it. It is a professional supportive solution which does not affect the rubber gasket and any other such tender elements inside the radiator. This product also holds a dominating position among various car enthusiasts. Bar’s Leak HG-1 Stop leak is a professional sealant which eminently bonds with the abrasions, wear and tear of the metal and the rubber parts inside the engine in order to reduce the risk of engine failure. It has ceramic substance and the reinforced fibers which when used in the regular system combines with the regular fluid like oils and coolants to form a strong sealant. It not only seals the radiators and the coolant tanks but also heater cores, gas plugs, manifolds, and cylinder heads. Moreover, it contains Xtreme cool additives which reduce the temperature of the coolant. Bar’s Leak HG-1 Stop leak is also highly compatible with various engines involving diesel engines, gasoline engines, turbo and racing engines etc. Unlike any other product, bar’s Leak HG-1 Stop leak requires no thermostat removal or draining and hence it holds a valuable position in our list of best stop leaks. Most of the stop leaks when used shall lock the small passages in the coolant system but Dike Temporary Radiator Stop Leak shall not hinder the flow of any fluid inside the regular working system especially in coolants. It is very much gasket-friendly and hence it does not wear the rubber accessories. Instead, it forms a stiff coat over the worn rubber and corroded metal parts and hence reinforces that engine part and stops the leak if any. Sometimes, the antifreeze solution shall seep into the engine through the worn metal parts. When this solution enters other parts of the engine which works with other liquids, the result shall be worse. Hence in order to avoid such unwanted deterioration of the engine Dike, Temporary Radiator Stop Leak shall be used which seals such damages in very limited time. Bar’s Leaks 1000 Stop leak is a standard solution to the leakage problem which has been put forward by the popular Bar leaks organization. The additives in the Bar’s Leaks 1000 Stop leak solution hinders many problems of the engine and renovates the compression and power thereby increasing the performance of the engine substantially. It can be used with all type of formulations which have been used for petroleum, high speed, high mileage formulas, but the result obtained after using the Bar’s Leaks 1000 Stop leak shall be the same and evident. The natural wear inside the engines causes various issues like lower mileage, leak, smoking, noise etc which can be easily eradicated by this effective formulation. Moreover, it increases the oil pressure inside the engine and also reduces the friction the moving parts thereby reducing the wear and tear of the engine and thus reducing noise. AlumAseal Stop leaks are a specially manufactured powder which is used to seal the leaks in no time. It can seal the cooling system parts, metals, plastics in all parts of the engines. Additionally, it is also a rubber friendly powder which not only cleans the rubber worn outs but also provides adequate lubrication to it. Moreover, the corrosions in the metal parts and the damages in the moveable parts shall also be restored with this AlumAseal Stop leaks. Coolants which are made up of ethylene glycol, silicates etc can also be treated by the AlumAseal Stop leaks in order to get astonishing results. Although AlumAseal Stop leak powder is highly viscous, it does not clog any cooling system and hinder any regular process. Water pumps can also be lubricated with this magical powder to get optimal results. J-B Weld DS-114 Radiator Stop Leak is a good working stop leak which promotes sealing the leaks in the radiators of various vehicles like van, bus, tractor etc. When is used with the coolant system it does not inhibit its regular function, but lubricated and removes corrosion from the cooling system. Moreover, the J-B Weld DS-114 Radiator Stop Leak is a non-toxic material which when making contact with your body does not cause any damage. Folks who are vulnerable to allergies should be careful while handling this sealant. J-B Weld DS-114 Radiator Stop Leak is a powder which should be administered to your vehicles through the coolant system. Simply pour the contents into the coolant tank and run the vehicle and make the coolant circulate properly. Run the engine until the leak stops. This handy product which is also rubber friendly thus proves to be very useful to all. Bar’s Leaks 1186 Liquid Aluminum Stop Leak is an eminent solution to all the leakage issue in the coolants system. Usually, a coolant is used to reduce the temperature in the engine of the vehicle. Supporting that feature, Bar’s Leaks 1186 Liquid Aluminum Stop Leak also prevents overheating of the engine thereby reduces the temperature of the water. It is a liquid solution with aluminum additives which is very dense and viscous fluid which seals the gasket leaks, heat core leaks, freeze plug leaks. Usually, 20 minutes is the time required to seal the leaks, but depending upon the wear and tear of the engine, the time shall elapse to some extent. 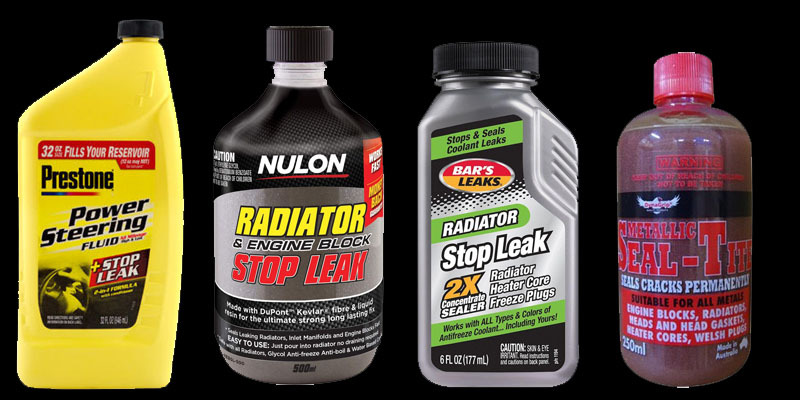 Bar’s Leaks G12BP-7PK Radiator Stop Leak Powder is a vital element which can completely cleanse the radiator without any flaw. Usually, when a user finds his car to work improperly or when he finds a leak he always intends to take his vehicle to a workshop. Before doing so, it is highly recommended to use this sealant powder which forms a viscous liquid with the coolant and gets into the engine coolant system thereby sealing all the leaks within minutes. Apart from sealing the metallic parts of Bar’s Leaks G12BP-7PK Radiator Stop Leak Powder also aims at sealing the plastic, aluminum, heater cores, freeze plugs etc. Additionally, this sealant powder is also suitable for all types of coolants which include silicate and non-silicate antifreeze. Hope this article has provided with enough knowledge about the various types of sealants which are used to seal the leaks in the radiators and such other accessories. Any suggestion from this list shall be deemed to be the worthwhile pick as it possesses unique significant feature.